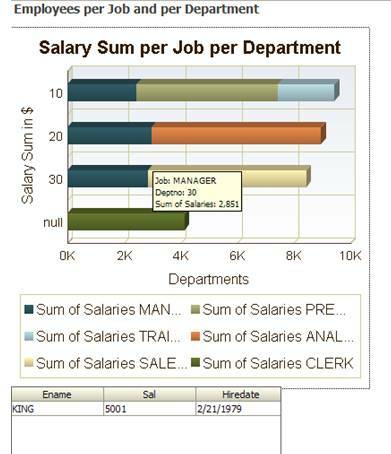 Whenever I click on a stack in the stacked bar chart â€“ representing a group of employees in a specific job in a certain department â€“ the table of employees below the chart is refreshed to only list the employees that belong to the selected stack. Of course the synchronization of the table with the chart is done automatically and AJAX style with a partial page refresh. 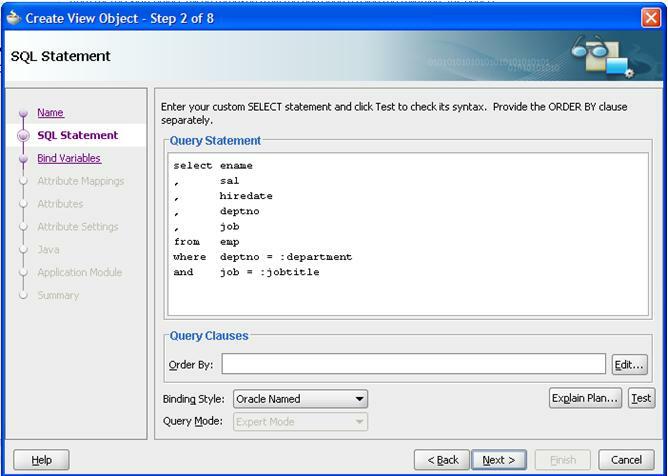 â€“ building on the page already created in the article referenced above – is the creation of a new ViewObject EmployeesInJobInDept that selects employees based on two bind parameters, one for job and one for department. 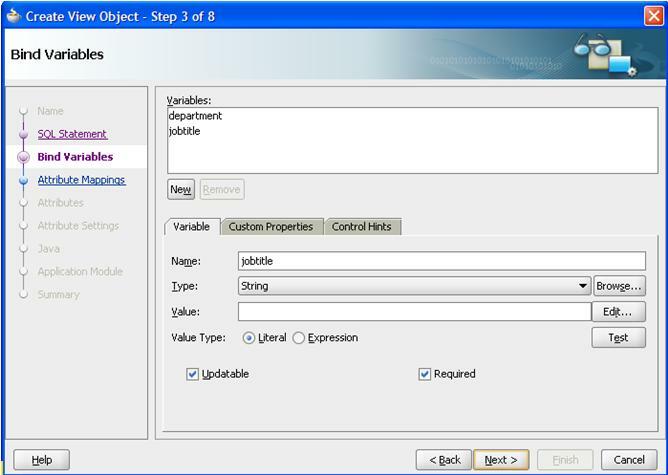 Add this ViewObject to the data model of the Application Module. 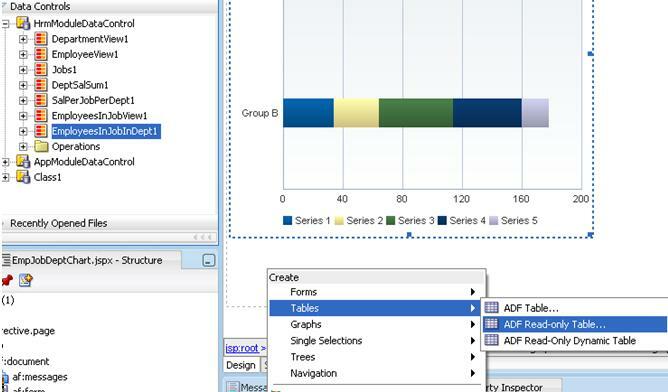 Now drag the EmployeesInJobInDept1 collection from the Data Control palette to the page, dropping it as an ADF Read Only Table. 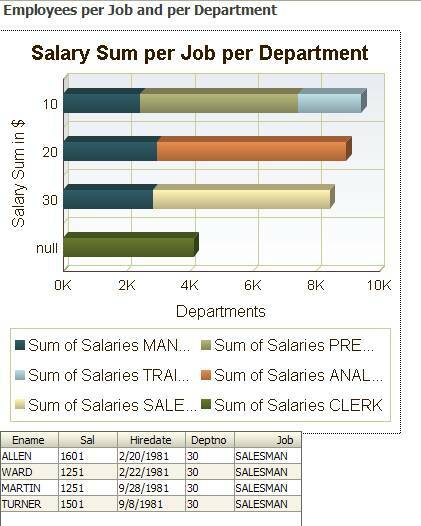 Enable sorting, pick the desired ordering of the columns etc. Then press OK.
Now we need to cater for the execution of the ViewObject (query), providing proper values for the bind parameters. 1. 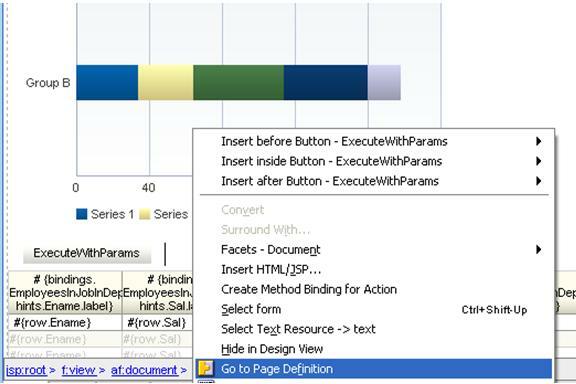 Drag the Execute With Params method under the EmployeesInJobInDept1 collection to the page, dropping it as a Command Button. Even though we created a Command Button, we do not really intend to ever use it. In fact, we will remove it from the page shortly. 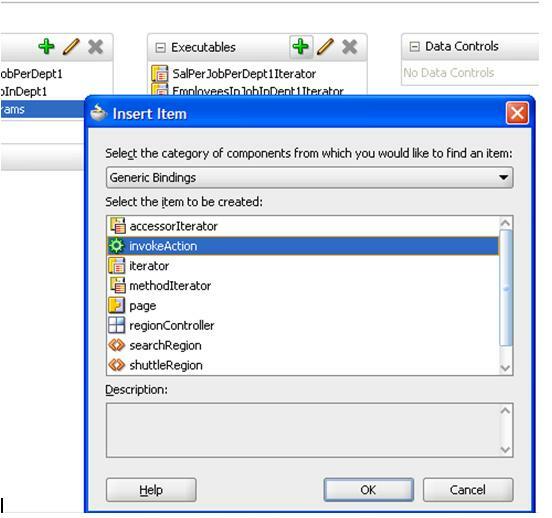 However, the drag and drop of the Operation as Command Button was the quickest way of creating the required element in the Page Definition file. Now we will create an ‘automatic’ way for performing the Execute With Params operation. 3. 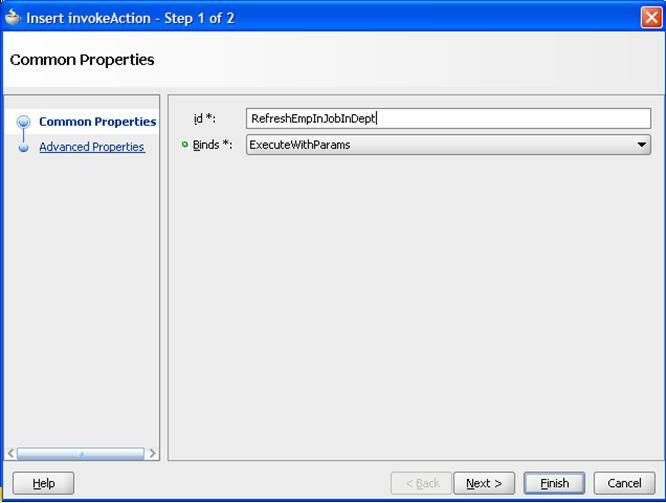 Inside the Executables section in the Page Definition, add an InvokeAction element. 4. Bind it to the ExecuteWithParams element that created when we dropped the Command Button on the page. 5. 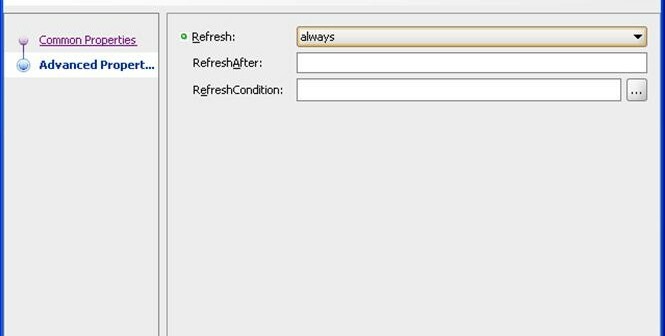 Set Refresh to always – a bit crude but it does the job. At a later stage we could find a more refined setting for the Refresh properties. The value for the department (bind) parameter is to be derived from a deptno property on the managed bean EmpSalBarListener. This property will be set in the ClickListener method, whenever the chart is clicked on. We do likewise for the jobtitle parameter, binding it to the job property in the EmpSalBarListener bean. 7. Now we can return to the page and remove the Command Button. 8. 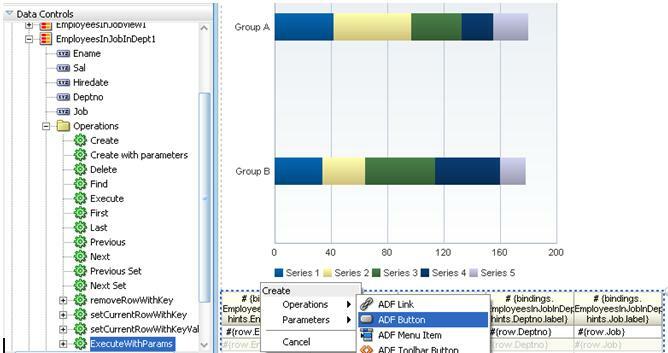 Set PartialSubmit is true for the Chart. This ensures that whenever the chart is clicked, a partial page refresh is initated that includes refreshing the table component. What we have achieved is an almost entirely declarative, visually appealing, functionally rich user interface. 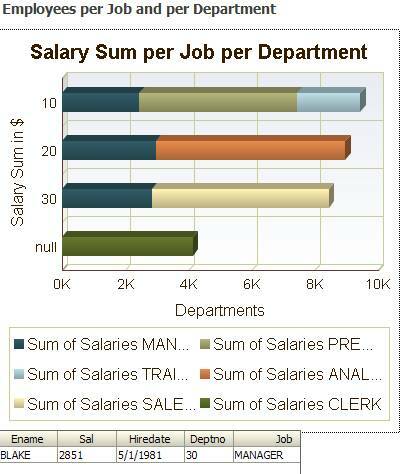 We can use the graph to select the data of interest and have the rest of the page synchronized with that selection. Of course it could also work the other way round: the graph is synchronized with an element selected in the table, or another graph. It certainly is something to embed in web pages. The screenshots in this article are from JSF (Java Server Faces) based Web Applications – a combination of HTML and some PNG graphics. And you’re right: it looks like Excel! Is this something to embed in the web pages ? This looks like excel graphs.